When Facial Feminization Surgery gives your facial skeleton a female outline, you probably want to show this outline sharply, without any saggy skin concealing or spoiling it. 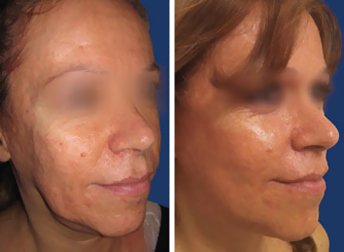 In young faces, soft tissues stretch back by themselves over the reduced, feminized facial bones, but in mature patients this doesn't happen, especially when the skin started to sag before Facial Feminization. Face Lift Surgery (also known as Rhytidectomy, rhytidoplasty, platysmaplasty, cheek lift or mid-face lift) brings out the shape of jaw and chin bones, pulls up the cheeks and jowls and gives your face an extra decade of youth for you to live it fully. What results should I expect from a face lift? It brings out the effects of Facial Feminization surgery on chin and jaw by tightening the skin and lax muscles of the cheeks and jowls. It enhances the cheeks by "pleating" stretched muscle tissues over the cheekbones, beneath the tightened skin, which can help you not to need cheek implants during your Facial Feminization Surgery. It reduces the nasolabial folds when they are produced by saggy cheeks. The more advanced the aging process is at the time of the facelift, or the higher the amount of bone removed during the Facial Feminization Surgery was, the more impressive the rejuvenating effect will be. When it is done together with neck lift surgery, forehead or brow lift surgery and eyelid lift surgery (blepharoplasty), a complete facial rejuvenation is achieved. What results should I NOT expect from a face lift? It is not a Facial Feminization Surgery by itself. It just brings out the facial bony outline you have. 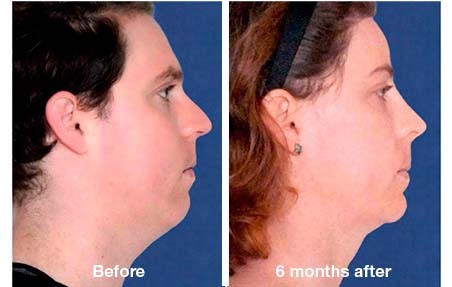 If your chin and jaw bones are male, you'd rather leave your saggy skin alone until you get a chin feminization, because tightening this skin with a facelift will bring out the maleness underneath. 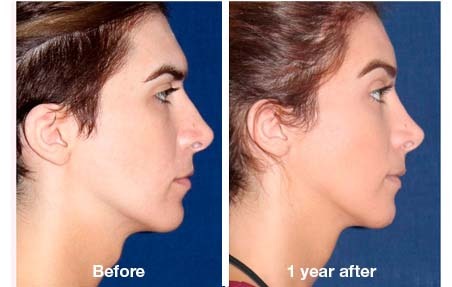 If your chin and jaw are naturally female or you underwent a Facial Feminization Surgery, then a Facelift will bring out the bones femaleness. The crow’s feet and wrinkles that appear around the eyes are a result of repeated muscular contraction and not of aging, so face-lift surgery will not improve them. It does not make any improvements on the forehead and eyebrows either. For that, forehead or brow lift surgery is necessary. 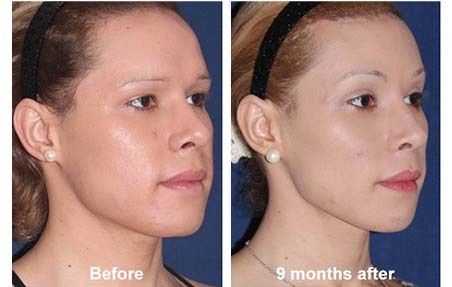 Can a face lift be done together with a Facial Feminization Surgery? Many surgeons prefer to do the soft tissues procedures in a second surgery several months after the bony Facial Feminization. However, both procedures can be performed together in one surgical act with very good and especially natural results. 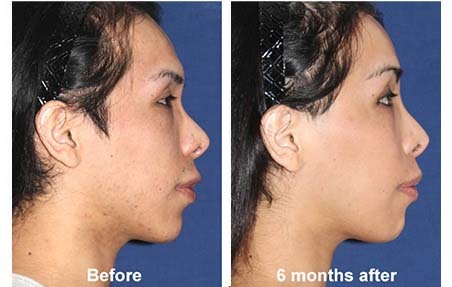 When the face lift is performed along with the feminization of the facial skeleton, it might result less perfect than when performed alone but for the mature patients the combination has the additional benefit of producing an immediate younger appearance that allows them to recover and enjoy in the right gender many years they spent living in the other one. 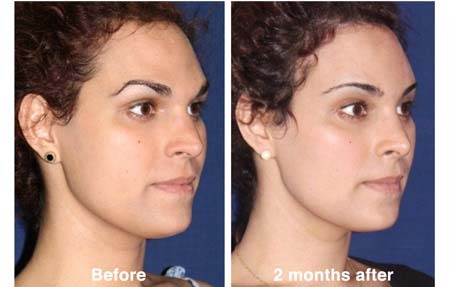 It must be understood as a complementary procedure that repositions the soft tissues in a way that brings out the feminization obtained on the facial bones (that otherwise would get concealed, not fully appreciable) and as a factor that sums up into the whole facial transformation rather than as a facelift per se, usually intended for just rejuvenation. Convenience is important too: doing Facial Feminization Surgery and Facelift all together means an important saving for the patient in money, flights, time off and healing time, and the relieve of having to pass through the inconveniences and pain of the recovery just one time. Between 2 and 3 hours. How is face lift performed? The surgeon makes an incision very close to your ear, following its natural outline. He separates the muscles and the skin of the middle area of your face and tightens them up towards the ears to give your face a more youthful look. Face lift also enhances the cheeks definition and volume. How can this be achieved? Well, the excess tissues that sag are part skin and part muscles. The surplus skin is cut out to allow the tightening of what is left, but the surplus muscles (worked at the SMAS level) are not cut out: they are instead folded up over the cheekbones. This means that the loose muscles that currently sag below the cheekbones are raised and repositioned as a pleat in front of them to make them look fuller beneath the tensed skin. This can help you avoid cheek implants during your Facial Feminization. 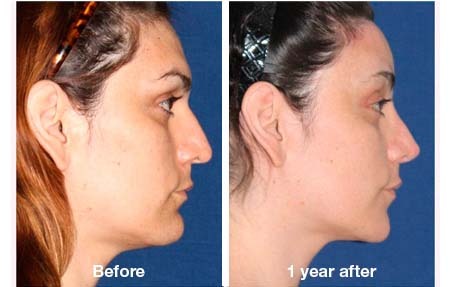 To rejuvenate lower areas of the face, such as the outline of the jaw, it is necessary to perform a neck lift surgery. 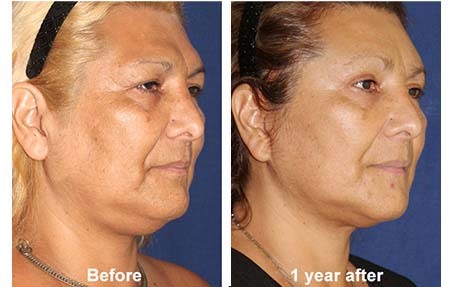 When Face lift is done with Facial Feminization it is the last procedure performed. Half a day. If done with facial feminization, two days. You will leave the operating room with a compression bandage around your head. It will reduce the inflammation and will be removed about 24 hours later. If performed with Facial Feminization it might be left on longer. The pain will be moderate. Around two weeks after the surgery. Bruises may develop, especially below the eyes. They will be at their worst during the first week but, as time goes by, they will slowly disappear. The swelling lasts about a month, although when Face Lift is done together with Facial Feminization Surgery it can last longer. Cold compresses may help you recover faster. During some days, you will have to sleep with your head higher than the rest of your body. The area where the incisions are made tends to heal very well, so the scars will not be spotted easily once they are fully healed. You will have to rest in the hotel for 48 hours, and be careful not to move your head too abruptly. At first, you may feel your cheeks numb. You may be able to go back to work and daily activities 10 days after the surgery, unless a Facial Feminization was performed, which makes the recovery period a bit longer. During this time, some people may feel somewhat depressed. It is quite normal to feel this way after any kind of surgery, no matter how simple it may be. You may even come to think that you made a big mistake. But don't worry. Most of the people who are happy today and who are satisfied with the results obtained, have also felt somewhat depressed. Face-lift surgery will make you look many years younger than you really are. The difference between your real age and your looks will last for decades; that is, as you grow older you will still look much younger than you really are. Moreover, if you have already had a facial feminization surgery, a face lift will adjust the soft areas of your face to your new bone structure and the feminization obtained on your face will be more clearly defined. Every surgery, no matter how simple it may be, has certain risks, and we should not rule them out. However, it is very unlikely for face-lift surgery to present any complications when performed by a qualified facial feminization surgeon. Infections may develop, but if you take the right antibiotics, they will be less likely to develop. Hypertrophic scars or keloids (excessive scar tissue due to genetic traits of certain skin types). 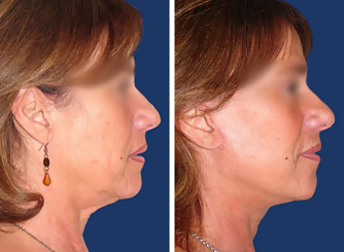 Face and neck lift in a cis patient. Pictures taken before and 3 months after the surgery.